For a lot of people, La Finestra in Cucina is the place to be. 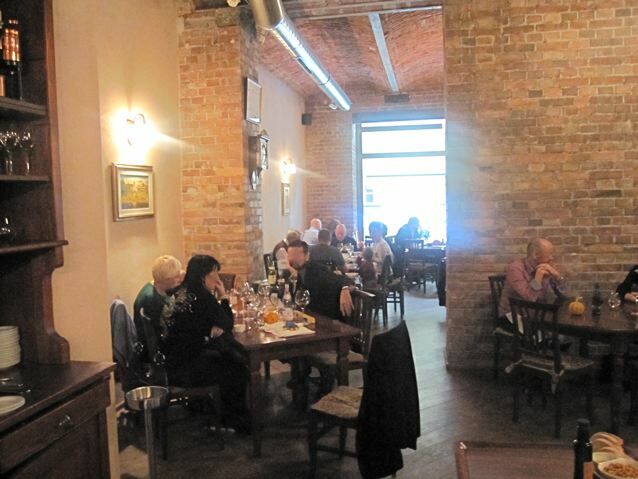 The Old Town Italian restaurant is a window on what's hot right now in Prague's restaurant scene. It's gotten some rave reviews. The Prague Post awarded La Finestra three stars out of four, with critic Claire Compton describing the food as "heavenly" and "ethereal." 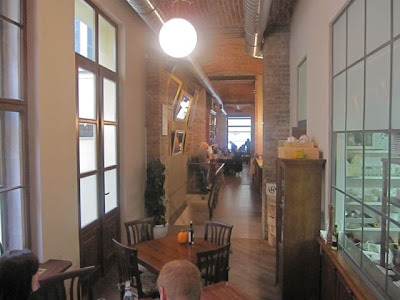 The Prague Spoon's Laura Baranik, usually parsimonious with her praise, gave it her highest rating, four spoons. The soon-to-be defunct Gourmet magazine's Alexander Lobrano described a much loved lunch of succulent veal, delicious potatoes, and excellent wine. I did find one mildly dissenting voice. It was that of Czech Business Weekly's Milan Ballik. Amidst many enjoyable dishes, he related his disappointing encounter with an overcooked, tough T-bone. I went twice to La Finestra. It's not very large, but it is a beautiful space with brick walls, vaulted brick ceilings, and hardwood floors. On the first visit, I made the mistake of thinking I didn't need a reservation at 1:30 p.m. on a Sunday. The place was packed with diners, including a few families with small children. I really wanted to try the place, so we reserved a table and decided to come back in 30 minutes. When we returned from a walk, our table still was not ready. 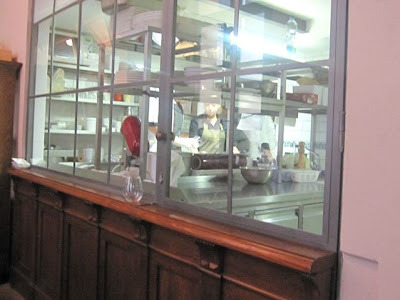 We were directed to the "bar," a tight space by the window to the kitchen which gives the restaurant its name. 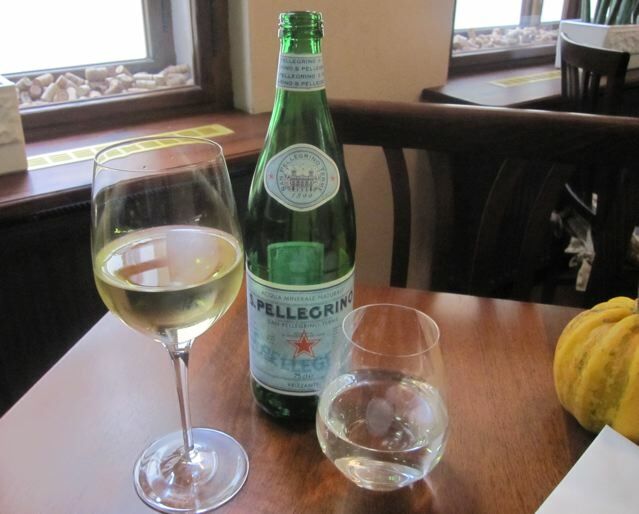 We ordered a .1 liter glass of prosecco (130 CZK) and a small bottle of Aquila water (45 CZK). Watching the chefs work and the food flying by was fun. Less enjoyable was the company at the bar. A portly, middle-aged man with a stinking cigar was showing off his flashy mobile phone to his young, blond girlfriend. From my point of view, puffing on a cigar in the presence of fine food is like swearing in a church. So, our good mood soured a bit. We were there for 15 minutes. I partly blamed myself for poor planning. I asked for a non-smoking table. 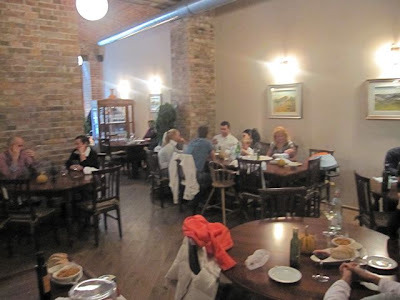 I was not thrilled that those tables were isolated in a narrow space at the back of the restaurant. Meanwhile, Mr. Stogie got one of the best tables in the house, by the front window. There was one benefit to our table. It was next to another window into the kitchen. It was great fun to watch the chefs at work through our meal. Unfortunately, our placement had a big drawback. The host seated all three non-smoking tables in the back at the same time. The same waiter had to take care of us all. Triple seating a server is something that restaurants should try to avoid at all costs. It seemed that we were third in line for everything all afternoon, and it got quite irritating. To start off, we got crusty, chewy bread. 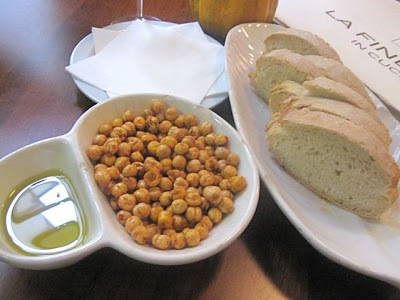 It came with good olive oil and fried chickpeas. We were starving, so we wolfed down several oil-laden slices. 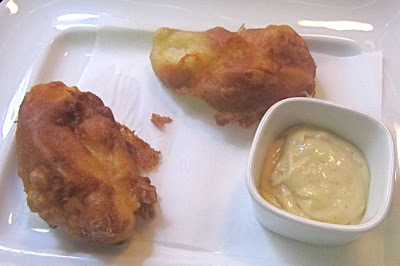 For an appetizer, I ordered the fried salt cod in crispy potato pastella (345 CZK). The presentation wasn't so pretty. The dough was greasy, with a soaked napkin sitting underneath them. But looks aren't everything. The dish came with an excellent, sweet-salty-sour homemade garlic mayonnaise. The delicate cod, mixed with the crunchy shell and the mayo, was a wonderful combination of flavors and textures. 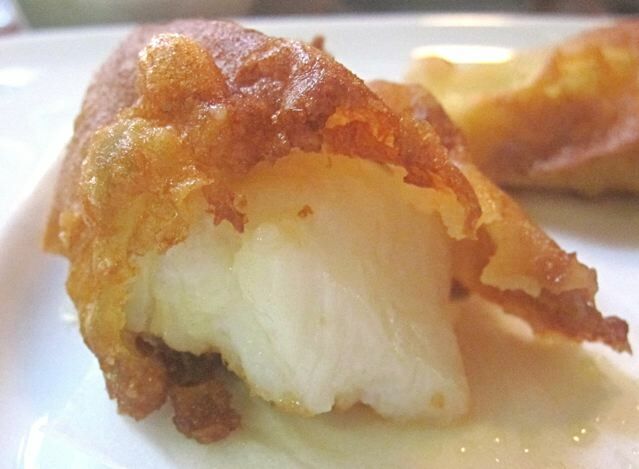 I often judge a restaurant on how they execute certain common dishes. We ordered the "Classic Caesar salad with anchovies" (245 CZK). The dressing is critically important. The flavor was almost there, but the texture was not. It was too thin and watery. I thought that the Romaine lettuce was slightly wilted, lacking crispness. I also considered it too small for the price. 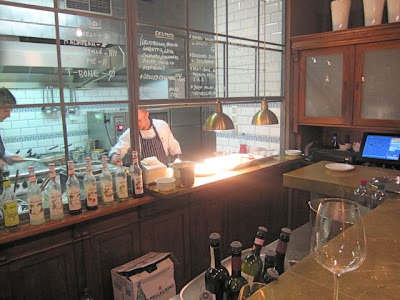 La Finestra and its sister restaurant, Aromi, take pride in their wine lists. Most of the wines by the glass were 180-200 CZK and that was for just .15 liter. We ordered the cheapest one they had, a Moravian white for 130 CZK. The waiter forgot about it and eventually had to be reminded to bring it. He was apologetic. For me, it was too fruity, sweet, and one-dimensional. I didn't like it at all. We shared a big bottle of San Pellegrino mineral water (95 CZK). 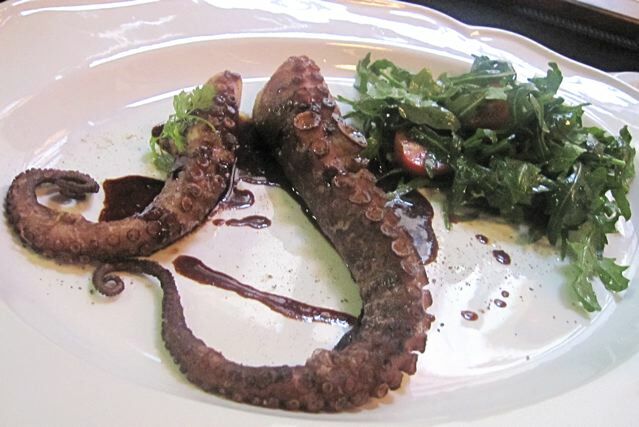 We tried the grilled octopus (425 CZK). It came with a Chianti wine reduction and a rucola salad. The meat was tender, but with some snap to it. There was a good balance of salt, with a slight smokiness. We liked the octopus by itself. But we decided the wine reduction was not a good match for it. It was sweet, but not acidic enough. It would have gone perfectly with a red meat dish like lamb but seemed out of place with seafood. 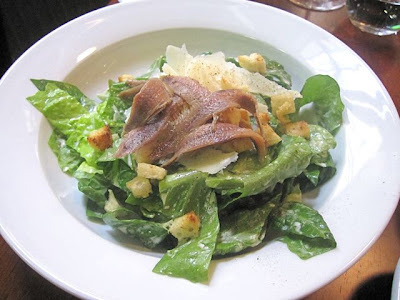 The dressed rucola leaves were too boring and ordinary. I had the veal saltimbocca. 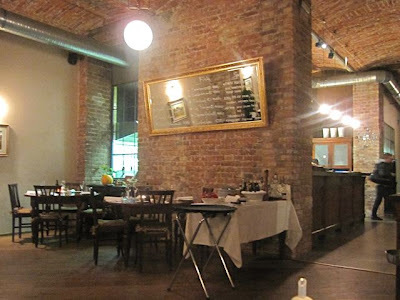 It cost 425 CZK, but note that as of this writing, the menu on the website said it was 345 CZK. 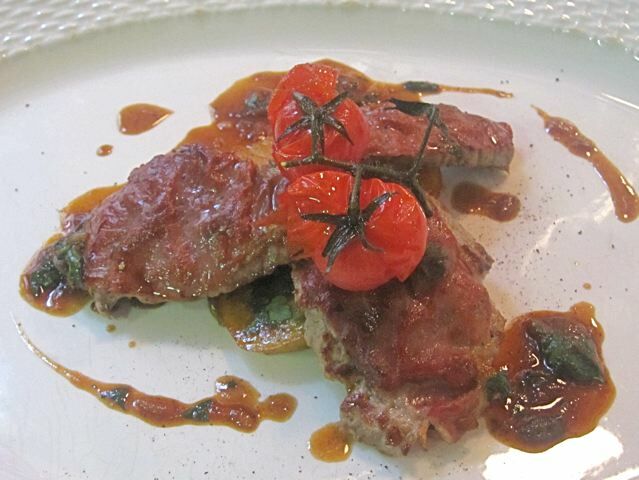 In Italian, "saltimbocca" means "jumps in the mouth." But with this particular dish, I'd say the white meat couldn't jump. The veal had a number of problems. It was overcooked, and it was a tough cut. Perhaps that was because it was thicker than versions I'd had in the past. It had pounding marks on it, but the hammering didn't do enough to tenderize it. By itself, the meat was dry and bland. The prosciutto, so delicate in its cured state, had been reduced to the texture of shoe leather. It was actually difficult to cut. Its saltiness did balance out the blandness of the meat, but my jaw grew weary from the chewing. The other major ingredient in saltimbocca is sage. I love sage. But in this case, it was super intense and overwhelmed the sauce. I had to use it sparingly. The one saving grace was the onion potatoes. The sweet, fried onions, mixed with the buttery potatoes were a pure joy. But it was not enough to relieve my unhappiness with everything else on the plate. I was full, but I always have room for dessert. I was very curious about the vanilla souffle, but couldn't bear the thought of waiting for it to be cooked to order. At times, our waiter could be very polite and solicitous, but then he'd go MIA. We were already at the two hour mark. Dishes needed to be cleared, and he was having a conversation with the big spending table next to us. 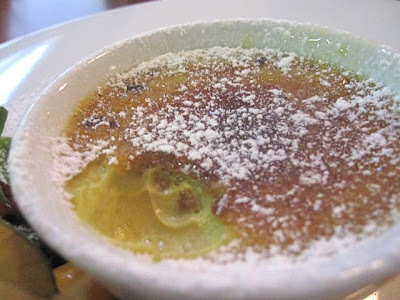 I decided to keep it simple and ordered the pistachio crème brûlée (175 CZK). This was quite perfect. It was smooth, creamy, and rich, with the special and specific taste of green pistachio paste. I got to see the chef through the window hit it with a blowtorch to seal the top. I loved every bite. Getting the check required another waiting game, even though by this time, after 4 p.m., the restaurant was almost empty. The bill came to 2145 CZK, plus tip. I was rather annoyed at this point, so I left less than the usual amount. We felt the restaurant was a mixed bag and left disappointed. I understand that reading a lot of hype about a restaurant can lead to inflated expectations. I also considered that bad timing on a busy Sunday had led to perhaps unusual problems. So I had to try again. On my next visit, I dined solo during a relative lull at 6 p.m. on a Monday. And despite the early quietude, I heard them fielding phone calls for reservations that evening and saying they were fully booked. There was no awkwardness due to my solo status. The service was friendly, but too active. I was asked the same questions by two different waiters and a manager. My scanning of the menu was interrupted several times in quick succession. I asked the waiter to recommend a glass of red wine to go with my meal. 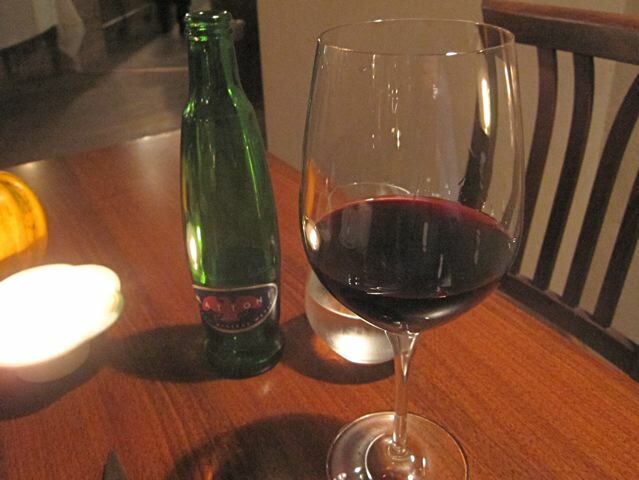 He suggested the Barbera d´Asti, Cá di Pian (200 CZK for .15 liter). It was as he described it -- medium-bodied, lightly acidic and tannic. The first taste wasn't as smooth as I'd hoped, but I warmed to it as the meal progressed. 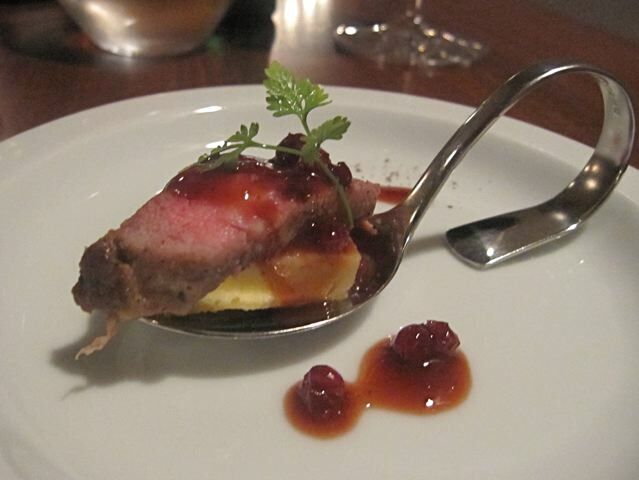 I received an amuse bouche of beef tagliata with grilled polenta and cranberries. The cool, rare beef and cranberries were excellent together, but the polenta was unpleasantly cold. I noticed that they do consider the seasons when putting their menu together. 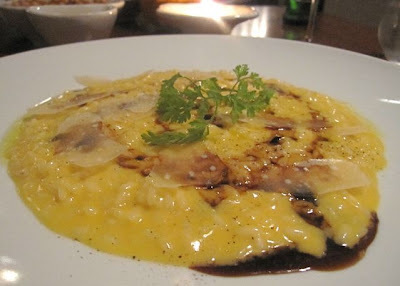 I ordered the pumpkin risotto with Parmesan cheese and aged balsamico (295 CZK/appetizer portion). The very al dente, creamy rice was a pure pleasure on each fork full, with the tart cheese and sweet vinegar. I liked it a lot, but one thing puzzled me. I tried and tried, but despite the orange color, I could not taste the pumpkin. A small disappointment in an otherwise delicious dish. 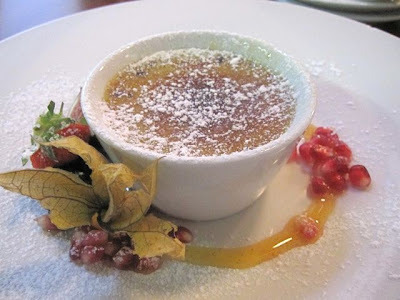 After this, there was another amuse bouche -- a small glass of creamy, very sweet lime sorbet. I had one small taste, and then my main course arrived. This was clearly a service snafu. The waitress grabbed my sorbet and started moving quickly away. "Hey, hey, hey! I'm not finished with that!" "Yes, but it won't be so good now with your meal. I will bring you another one later." And she was gone. True, there was some sense in this. However, she never did bring me back another one, as promised. It was forgotten. 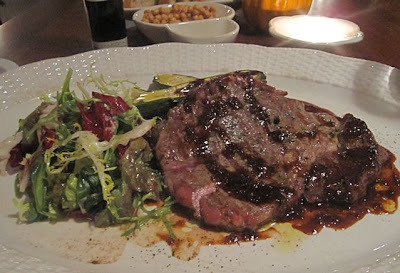 My main course was a 300 gram rib eye in mustard sauce with Italian zucchini and a small salad (595 CZK). I was told it was Italian beef cooked over a lava grill. I was confused when it arrived. On the beef was a reddish-brown sauce, so I called over the waitress. "Just wondering, what kind of sauce is this?" "I was curious because it doesn't look like mustard. Or just not what I expected." "Yes, it is a demi-glass with mustard mixed in. Is there a problem?" "No, not at all. I love demi-glace. I just found the description confusing." She looked concerned until I assured her that it really wasn't a problem. The sauce was positively popping with peppercorns and rather salty. But it was rich, satisfying, and almost decadent on the meat. 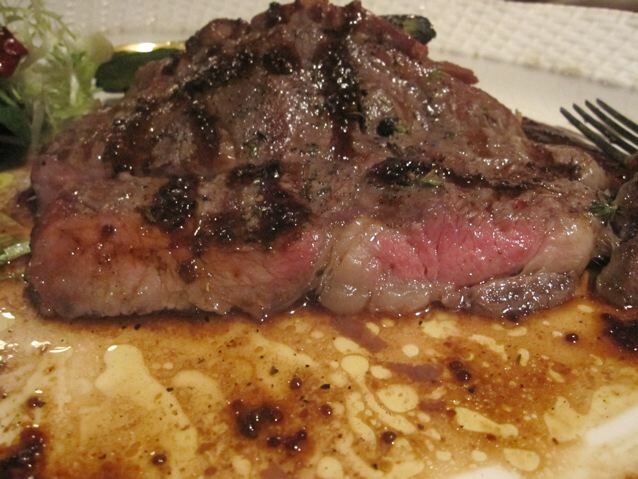 The beef itself was quite different from an American rib eye. The thin cut, cooked medium-rare, was certainly tender, with a healthy marbling of fat in the middle. But the flesh had more of a firmness or denseness to it. It picked up a hint of smoke from the grill, and I enjoyed every bite. The lightly grilled zucchini also tasted of the grill and, along with the light, acidic salad, provided a great counterpoint. Potatoes would have been too much. I couldn't finish it. I thought it would be a shame to finish it after my appetite diminished. I took the rest home. 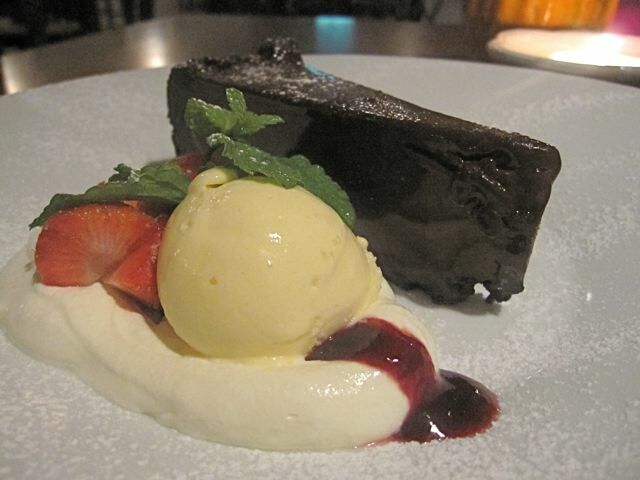 As I said earlier, I always have room for dessert, and I really wanted to try the chocolate truffle cake (165 CZK). This cake is notable for having actual truffles in it. The kind you dig up from the ground. Other reviews have commented positively on it. The chocolate in the cake was rich, intense, and very fudgy. It was surrounded by fresh whipped cream, strawberries, and vanilla ice cream that didn't impress me. You don't exactly taste the fungus in the cake as much as you detect its subtle aroma in your nose. I did not like it at all. It was just strange, and the jarring juxtaposition diverted my thoughts from the great chocolate with every bite. Try as I might, I couldn't get used to it. I have one other small observation about the ends of meals. At the end of our last visit to Aromi, we received two complimentary glasses of limoncello. 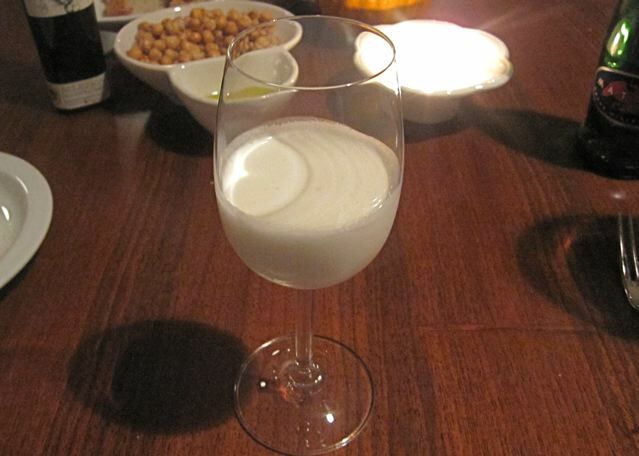 During my visits to La Finestra, I saw many tables receiving limoncello. Whether they paid for it, I do not know. But none was offered to me either time. It set my mind to wondering. So, if you go there and you do get free limoncello, I'd love to know how you qualify. I liked at least half the dishes at La Finestra, but for these prices, I'd say they need to do better. The service was always polite and occasionally good. But it also lacked focus and consistency. It felt like style over substance. 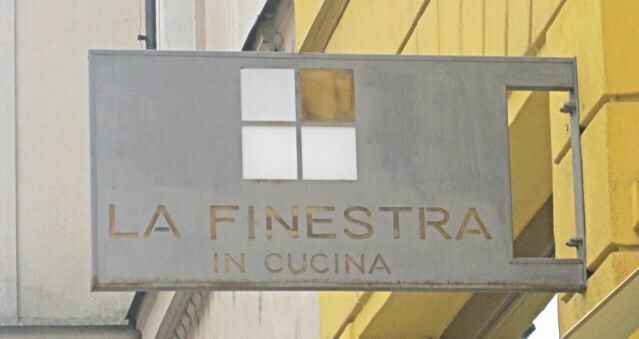 Does La Finestra deserve three stars? Four spoons? I don't give stars or spoons. 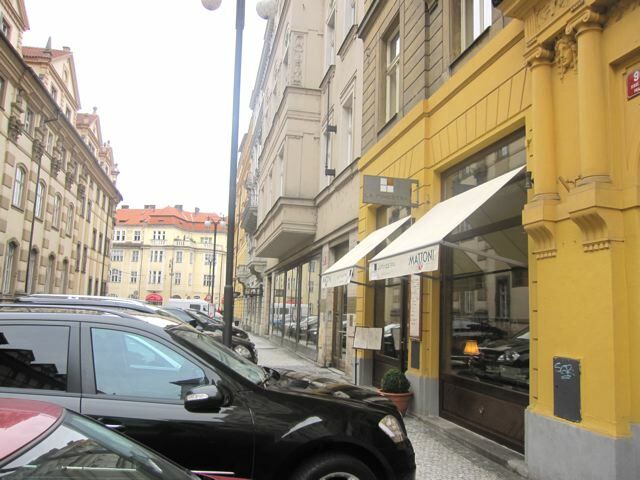 But over the course of two meals, I did give them 3800 Czech crowns from my own pocket. I may be in the dissenting minority, but I do think that was too generous for what I received in return. Haha! White meat can't jump! Funny! E smettila di fotografare le bottiglie di minerale.